I cut out my Anas Acuta seat. 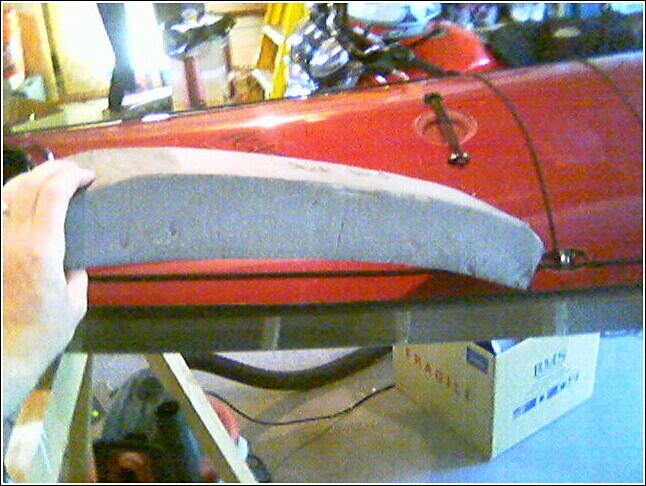 I added a foam seat I shaped myself that is 1/4" thicker and I can lay completely flat on the deck now. I also added a removable masik. The masik has made rolling almost too easy. I was testing it by myself so I didn't try hand rolls but I can scull, brace, and roll with little effort now. Amazing. I do have a little trouble wet exiting with it in so I may have to make some adjustments before I make it permanent. Maybe I will always leave it removable so others can paddle my boat easier. We will see. Right now I pop my skirt, knock the masik out of alignment so it sits parallel with my legs, and exit. I tested this once but I don't usually get out of my boat now. I like to just go to my standard roll. Yeah, masiks are great for rolling. When working on some of the more difficult rolls, you want your body's rotation most efficiently transferred to the boat with minimal wasted motion which is what the masik tends to facilitate. The Anas Acuta rolls beautifully and you've done exactly what I would have done in that boat (take out the seat, install an IR Reggie backband, and install a foam masik). I'm looking forward to your Qajaq TC recap since it sounds like you had a great experience.